This will be our last visit to the Magic Kingdom for a while. Our budget-priced 170-day Southern California passes are not good for the last part of June, all of July, and the first part of August. We won’t be able to go back until August 18 … and probably won’t then, if this visit is any indicator. In a word: HOT! I guess I’m a wimp. It wasn’t actually that hot, mid to upper 80s. I used to be able to shrug that off. Heck, when I was in the 1st and 2nd grade in Fort Worth, I’d go out and play, and hunt for horned toads, when the thermometer was well over 100. No more. But I was heartened to see that I wasn’t the only one who was feeling the heat, and that it wasn’t just us old farts, either. A lot of younger people were looking sweaty and red-faced. The dudes manning the carts selling Minute Maid frozen lemonade couldn’t keep up with the traffic. There were lines. Lee and I each ate a swirly lemon-vanilla ice cream cone, sitting in the shade of Ariel’s Grotto in California Adventure. I later had a frozen lemonade, too, and I could have eaten a dozen of them … slowly. They keep those things cold with dry ice, and when you get them they are hard as a rock. But that’s okay. You hold them in your hot little hands and poke at them with the little plastic spoon, and scrape out a tiny little bite. As you go along it gets easier to dig it out. Finally you’re getting decent-sized spoonfuls, and your mouth is gloriously cold. Cold! Let me tell you, on a hot day, there is nothing that can touch a frozen lemonade. We started our day at the Grand Californian Hotel, the only hotel in the Disney empire that opens directly into a theme park. No tram ride, no monorail. 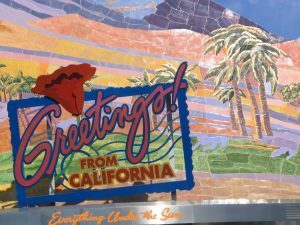 Step outside the lobby and there you are, in California Adventure. As the tram conductor usually tells you on your way in from the parking structure, the hotel is inspired by the Arts and Crafts movement … and actually, I’m confused about that. The Wikipedia article mentions Arts and Crafts, but also says the building is Craftsman, which is a slightly different school of thought. Myself, I think it looks like mega-craftsman, with a lot of National Park Service thrown in. When we reached the grand, stunning lobby we were reminded of Timberline Lodge on Mount Hood, though the lighting is much more ornate. Apparently it also recalls the lodges at Yellowstone and Yosemite, and from the pictures I found, I’d agree with that. Whatever style it is, it’s a wonderful place. Lots of stone, lots of wood, lots of Frank Lloyd Wright. It was designed by Peter Dominick. Wandering around, we found the big pool area, which had a lot of small waterslides for the kids. There was a spa, and several upscale restaurants. Our first reaction: We probably wouldn’t want to stay here, as neither of us are pool people. We’d be spending a lot of money for facilities we wouldn’t be using. My second reaction, after wandering around for a while: Hell, if I was rich enough I’d stay here in a heartbeat. It’s such a lovely setting. Rich is the key word, though. The cheapest room is $345 in the off season, and that’s without a view. Summer season, with something to look at, you’re talking $465. “Concierge” rooms are $670 per night, and I didn’t even get into the suites. I sure don’t want kids to get hurt, but sometimes I think we coddle them too much these days. I know, it makes no sense for an old fogy like me to point out that we didn’t need no stinkin’ helmets when we rode our bicycles, because the sad truth is that some kids back then paid the price by busting their heads open, getting brain damaged, paralyzed … all the awful things that can happen to a child. Helmets are a good thing, I’m not disputing it. It’s just that … I get nostalgic when I think of the play equipment we risked life and limb on when I was young. It was all made of metal, held together with bolts that got rusty after the first time it was rained on. Playhouses and treehouses were built either by the kids, or their dads, and were made of wood. These plastic forts and playhouses I see everywhere now are so … plastic. But this place looks like a lot of fun. There is a grotto where you press your hand into a lighted indentation, and the Spirit of Something-or-Other decides what your animal avatar is. I was a hawk, which pleased me. I’d like to fly, and if I were an animal, I’d damn sure want to be predator. There was an ingenious—and very, very, very safe—tire ride, where you sat in the tire and it ran along a wire, back and forth. We were too big to ride that. There are many places to climb—all carefully netted off so no one could possibly hurt themselves. There was a walk with carved animals and interesting facts about them. And finally there was the Magic of Brother Bear Totem Ceremony. A guy who looked like an Indian showed up and put on a rather frantic and overdone (for me; the kids seemed to be enjoying it) show. Wooden totems came to life and interacted with him, and finally Brother Bear himself arrived and wowed the kiddies. I haven’t seen that movie yet, but I have a video of it on the shelf. Some day. (B TICKET) King Triton’s Carousel. 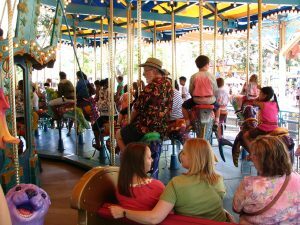 One of the nicer merry-go-rounds I’ve ever been on. 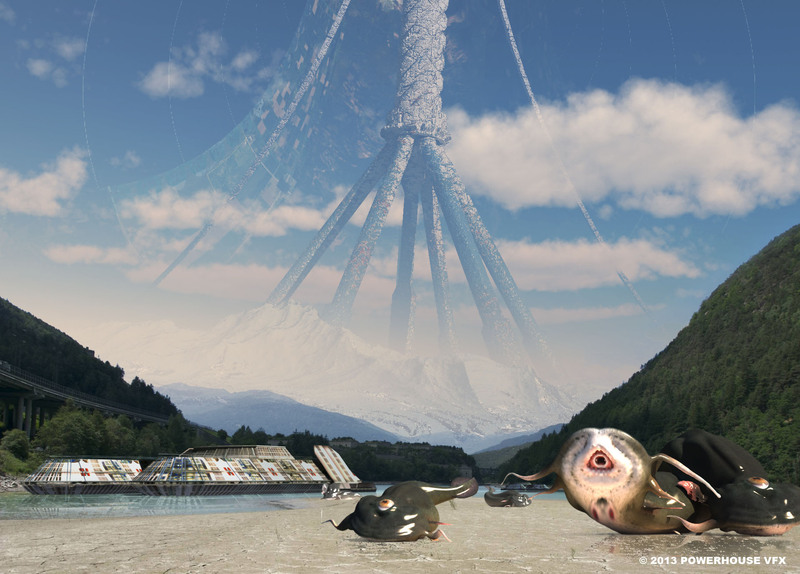 Instead of horses, there are dozens of different sea creatures. And on the outside, along the top rim, are lovely depictions of all the great California amusement piers of the past. The coast used to be dotted with them, but they gradually lost popularity, or were lost to storms, or fire, and now the only one in this area is the Santa Monica Pier. (A TICKET) Mission Tortilla Factory. (A TICKET) The Bakery Tour. Maybe not quite as deadly dull as they sound, but it’s a good thing they don’t go on too long. Both places smell good, and on a hot day the air-conditioned buildings would be a good place to cool off for a while. 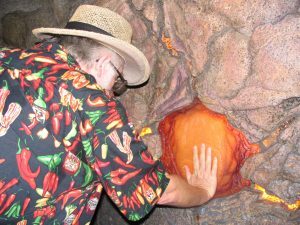 You get to taste free samples, just about the only free things I can think of in the Magic Kingdom! 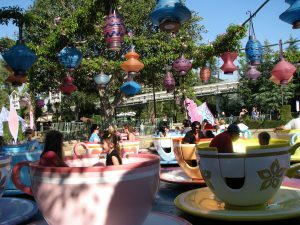 (B TICKET) Disneyland: The First 50 Magical Years. This is the attraction that displaced Great Moments With Mr. Lincoln from his 40-year run at the Opera House on Main Street. (I first saw him at the New York World’s Fair back when he was one of the marvels of the age. He was the first human audio-animatronic ever, and we thought he was absolutely amazing. The story goes that, during a test demonstration, he sprung a leak of red hydraulic fluid all over his chest, leading an observer to wonder if Walt was reenacting Lincoln’s assassination!) Wiki says this show is temporary, with an indefinite run, and there is a possibility that Abe will be back. I’m not sure I’d welcome his return, as he is now old technology, and the exhibits there now include some that had been removed from the gallery over Pirates of the Caribbean to make way for something else. This stuff deserves to be seen, as well as the new items. It’s a small museum of the development of Disneyland, and includes a scale model of the park in 1955, when I would have cheerfully killed to get there from the deepest depths of Texas. It wasn’t nearly as elaborate then as it is now, there are great blank spaces that have since been filled in, but I’d have loved to ride on some of the Frontierland things that are now gone, like the railroad and the mule train … and beyond that, just to see the TWA Moonliner with my own eyes would have sent me straight to heaven. I had to content myself with a plastic model which I assembled and hung from the ceiling. After you’ve had time to study all this stuff you go into a theater and see a 17-minute movie starring Steve Martin and Donald Duck. It’s an okay movie, but I chiefly enjoyed the time to rest my feet in a cooled auditorium. (E TICKET) Grizzly River Run. I was beginning to wonder if we’d ever get to this. During our early visits it was too cold for either of us to consider it. Then one day it was warm enough, and I had convinced Lee to ride it with me. We got our Fast Pass tickets to return in a few hours. But when we came back, the ride had broken down. 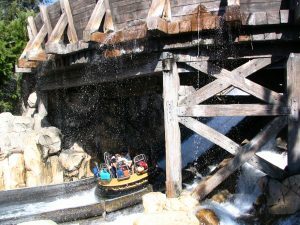 They were carefully taking riders off the long ramp that takes them to the top of the flume and escorting them down the wet steps. We gave up. But the next time was one of those walk-on days. There was no line to speak of. We went into the Rushin’ River Outfitters next door and bought a … I was going to say “cheap” rain cape, but there’s no way I can see $8 for a flimsy little thing meant to be used once as cheap. We had a more substantial one in the trunk of our car but we hadn’t brought it with us, as we hate to carry any more than we have to. So now it was either buy the $8 one, or take a tram ride back to the car, go on the ride … and then either take it back to the car, put it in a storage locker ($7.00!! ), carry it all day … or toss it. No-brainer. We’d waste the $8. 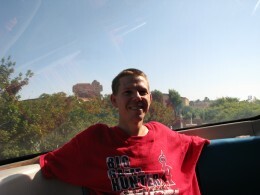 We don’t have any pictures of being on the ride, because Lee is very paranoid about water and her camera. On one of the first turns a wave washed over me from behind and for the rest of the ride I was sitting in a puddle. (Same thing happened to me the first time I was on a ride like this, in St. Louis many years ago when the “river raft” type ride was new, only that was a cold day!) Lee stayed nice and dry. When we got off we decided to give the cape to someone going in rather than toss it in a barrel. It took a while—most people who ride the thing want to get wet—but we finally gave it to a lady. (D TICKET) Honey, I Shrunk the Audience (1994). The Magic Eye Theater opened in 1986 with a nice little 3D feature called “Magic Journeys.” It was the first really good polarized-process 3D movie I’d ever seen. That show played for only four months before being replaced by the long-running “Captain EO” (short for EIEIO), so I must have been among the lucky (relatively) few who got to see it. EO was produced by George Lucas and directed by Francis Ford Coppola, closed in ’97, and was eventually replaced with this show, from Epcot. 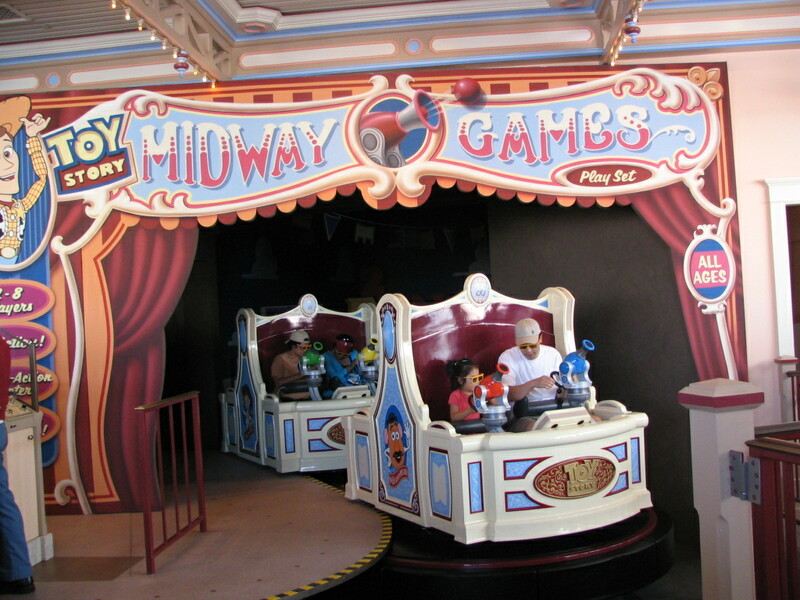 It does all the standard 3D tricks, accompanied by theater effects like shaking seats. I give it an OK, no more. I had a blast, and scored … I think about 87,000 points. Lee was slightly behind with 79,000. I’d love to ride it again. 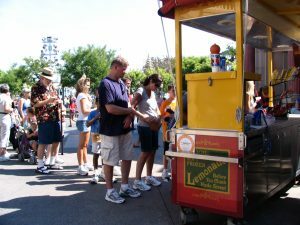 We were resigned to a long line, and the sign said there was a 30-minute wait, but we actually got aboard in 15 minutes. (B TICKET) Jedi Training Academy. We had had no intention of attending this, as it sounded like a kiddie thing. Shows you how wrong you can be. It is a kiddie thing, but those can be delightful. 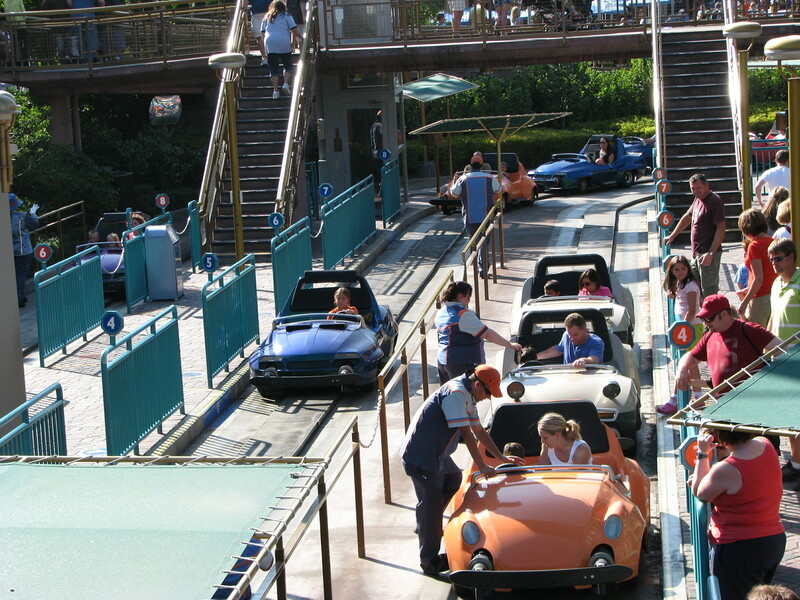 It takes place frequently at the Tomorrowland Terrace fast food joint, right by the long line for the submarine ride. There’s a stage there that isn’t very obvious; it rises from the ground and there they are: Darth Vader, Darth Maul, and two Imperial Stormtroopers (the worst shots in the Galaxy)! Before the show, all the volunteer Jedi tots have been fitted out with brown robes and light sabers. One by one they are brought forward and coached by two Jedi knights, and then they get to fight a duel with one of the Darths. And let me tell you, I really respect those dudes in the costumes, because they really have to work to make it look like any kind of a fight at all with some of these kids. But we did see one who just waded in, slashing left and right. The audience loved him. Vader retired in disarray. Naturally, all the kids emerge victorious, and Vader mutters his usual threats and appeals to come over to the dark side of the force. Not one kid took him up! (Surprise!) At the end they were all lined up and we cheered the new knights, and they got some sort of certificate. It’s really loads of fun to watch these kids. If you get a chance, check it out. 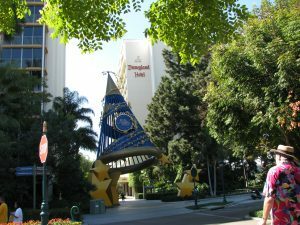 This time when we got off the tram we decided to head through Downtown Disney to the hotels of the resort, on the other side of Disneyland Drive. Before this, we’d never gotten farther than the Rainforest Café, where we’ve eaten twice. Many years ago I brought my family here and we stayed at the Disneyland Hotel. I wanted to see how much the place had changed. But first we dropped in at the Lego Store. Someday I want to go to Legoland. I know it’s mostly for the little kids, but I’d like to see the stuff they’ve built. The pictures look fantastic, and remind me of a place I visited in the Netherlands. I can’t think of the name of it now, but I always thought of it as Hampsterdam. (Ah! I found it. Isn’t the web wonderful? Type in “Netherlands miniature city” and you get … Madurodam.) Lego employs a lot of people whose job it is to build this stuff, and amazing stuff it is. 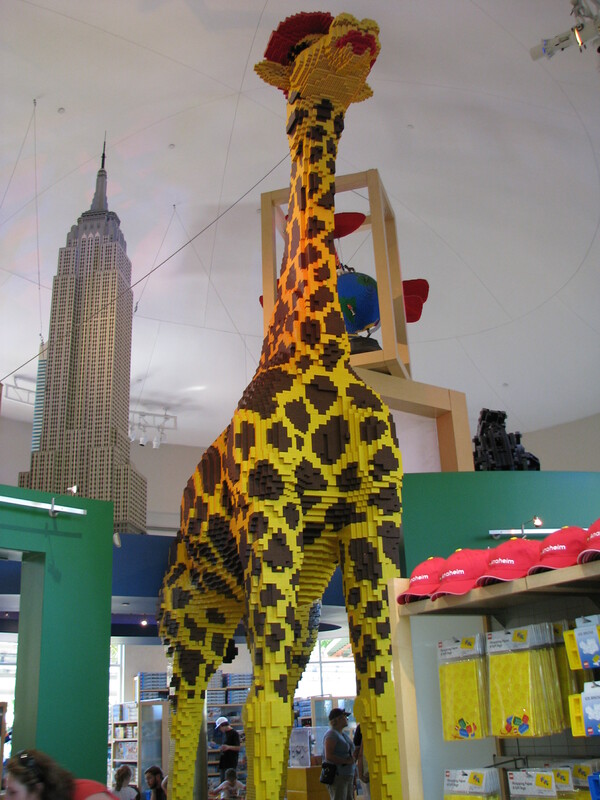 The centerpiece at the Disney Lego store is a life-sized giraffe. How do they do that? I suspect computers are involved. And I wonder, is it hollow in the middle, or solid? If the latter, that would be one heavy sumbitch. They also have R2-D2, a biplane, and New York buildings. But the thing that I’ll remember is the room with bins of Lego blocks in every color you could imagine, dozens of them. You could buy them by the pound, mix and match. Wow! On into the hotel area, we passed under a big magician’s hat and big gold stars. 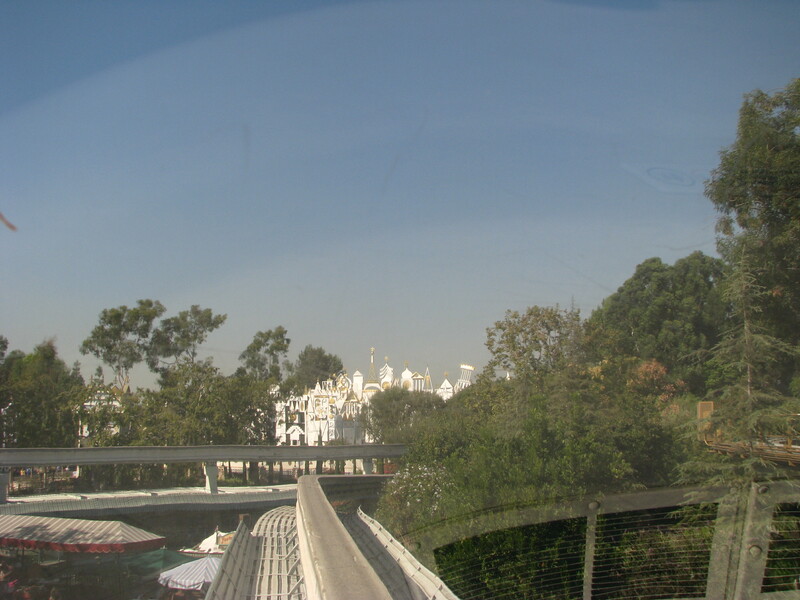 I assume they didn’t build this thing for the Year of a Million Dreams (and we’re about up to the 950,000th dream by now, it’s almost over) but painted an existing structure. Even Disney wouldn’t build something this huge and this solid to last only one year, would they? Hell, maybe they would. Maybe next year it’ll be gone. When I stayed here in the ‘80s, there were two towers, and now there are three. We could look down from the balcony of our room and see several restaurants, and a body of water with some fountains in it. I can’t remember if there was a swimming pool, but there was a pond with some of the biggest koi I’ve ever seen. That’s all been redone now. The last remnant is something best seen from a satellite picture, a semi-circular pool where they used to put on a show called Dancing Waters. I remember it was a lot of lights and moving jets of water. Primitive by today’s standards, but pretty all the same. 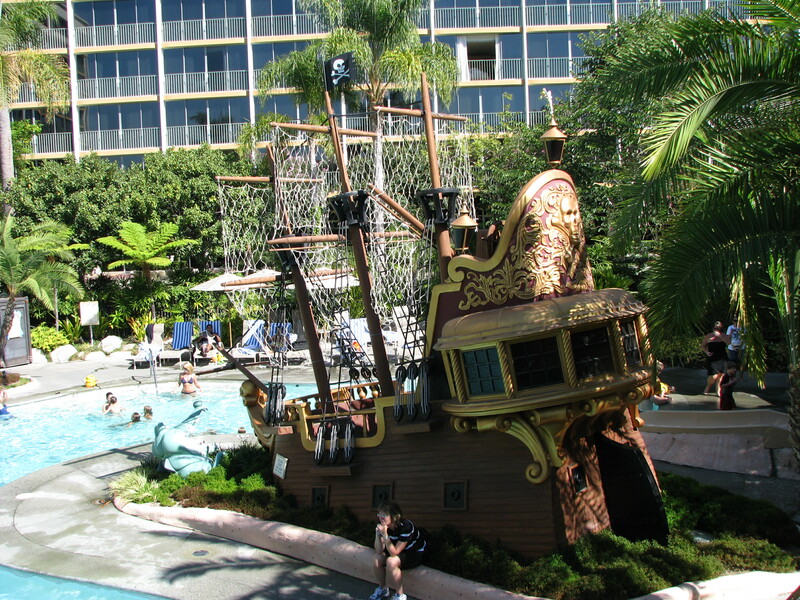 Now there’s a lot of trees and a free-form pool called the Neverland Pool. It’s mainly for children, only 4 feet deep all the way across, but plenty of adults were sunning themselves poolside. 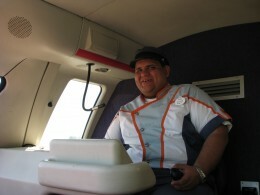 (These are the people who can’t afford the Grand Californian.) There’s a pirate ship in it, and Skull Rock, and two waterslides, including one for very small children. Near the newest tower, the Bonita, is a charming grotto full of pools and waterfalls. Unfortunately, most of it was roped off while cleaning was being done. We stopped for a while at some tables and a bewildered man, about our age, came up to us carrying a bag and asked if we knew where the laundromat was. We hadn’t a clue, but we talked for a while. His accent told me he was an Aussie, and sure enough, he was from Sydney, over here visiting grandkids. (C TICKET) King Arthur Carousel. Luckily, the answer was yes. I’d have died of embarrassment if I’d puked on a stupid merry-go-round. 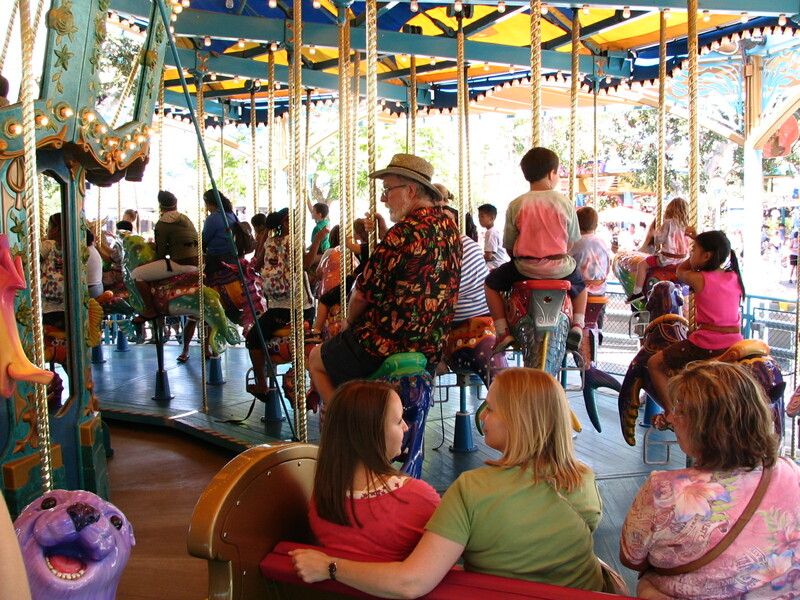 However, remembering how hard it was to get my arthritic leg over the sea creatures on King Triton’s Carousel and then keep it scrunched up while I rode, I elected to ride in the only bench seat. The ride is just as nice there. Though it wasn’t a terribly hot day, the heat was getting to both of us—me more than Lee—and we decided to call it a day, even though we had intended to stick around until dark and see the holiday lights and … well, Disneyland is just extra special after dark. So we have planned one more outing before our $129 (now $135) yearly passes expire. See you then, Mouseketeers! El Camino Real, a re-theming of the current parade route. Little Mermaid: Ariel’s Adventure, to replace the Golden Dreams movie, which has already been shut down. Buena Vista Street, a re-theming of Sunshine Plaza. Originally it was going to be called Walt Disney Plaza, now it will become a neighborhood in early Los Angeles. 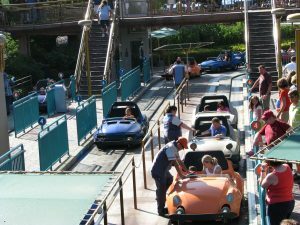 Cars Land, an entirely new area of California Adventure!!! A Beer Garden will replace Pizza Oom Mow Mow (which seldom seems to be open, anyway) and Burger Invasion. 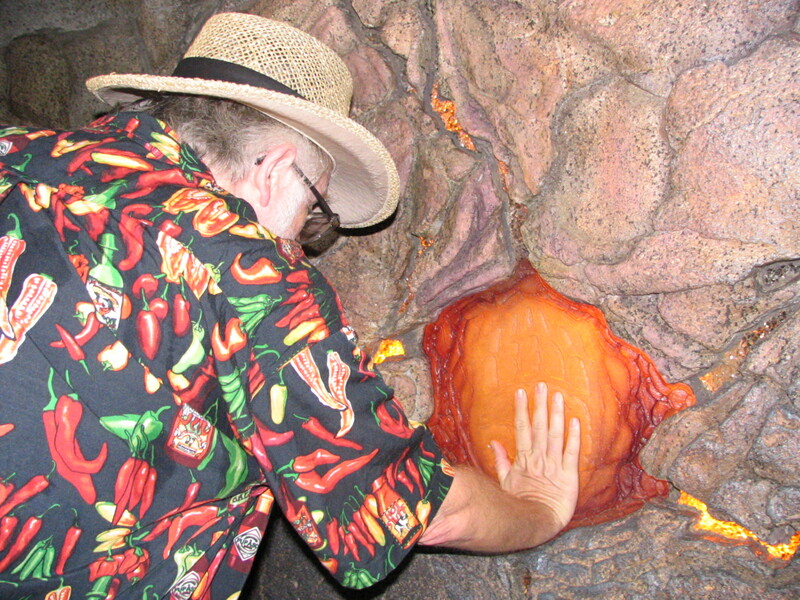 I am on record as opposing the sale of alcoholic beverages in the parks … but who’s listening to me? Red Car Line, which will run from the entrance, down Buena Vista Street, through Hollywoodland to Tower of Terror. I got to Los Angeles some years after General Motors bribed the city council to buy their smoggy buses and tear up the old streetcar lines. Did you know that, at one time, Los Angeles County had the most extensive streetcar network in the world? Now it’s costing us billions and billions of dollars to replace them. I look forward to riding on them.